In the spirit of Meg’s High Five Fridays, I’ve decided to make today’s post about some of my favorite blog posts over the past week or so! I read a lot of blogs (whether I comment or not!) and I’ve read some great posts so I wanted to share them with everyone! She also wrote about 3 ways to reduce stress instantly. Um, they work. I tried the laying on foam roller with your arms out one and it totally worked. Lindsay wrote a great post about how often the healthy living blogger world misses the mark. Many girls try and be perfect or appear to be perfect, when in reality no on is perfect and we shouldn’t be trying to strive for that. 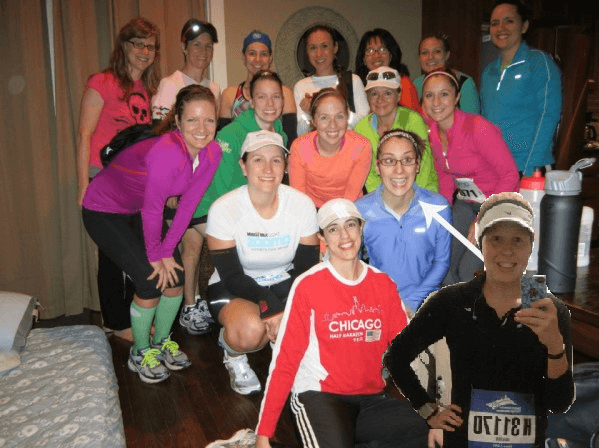 Cait sent me a link to her t-shirt store where she sells running shirts meant to motivate and inspire people to reach their goals, no matter how impossible they may seem! They’re really cute! Chelsey reminded us of making sure to appreciate all the little things in life that make us happy. Tessa wrote about deciding to take a blogging break, for many reasons. Although so many good things can come from the healthy living blogging world, it’s not always a great influence. It’s important to step back and make sure it’s not taking over your “real” life, especially for people like me who do it as a hobby! Cullen’s first birthday party. Enough said. And Emily’s wonderful tribute to her adorable little boy. Finally, Lindsay wrote a great post about un-glorifying the busy and about things that we should focus on in our lives. There you go, some seriously good reading for you this week! Have a great weekend everyone! Did you read any of these posts? What did you think? What were your favorite posts from the week?